Exercise keeps the human machine fine tuned. There is nothing so important as getting into physical exercise to achieve a long, healthy life. But, the most difficult part of exercise is getting started and forming the regular habit of being proud of your personal accomplishments. 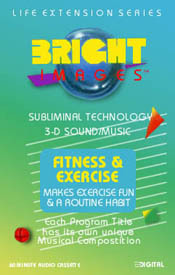 This program was designed to create exercise consciousness. You will increase your awareness of the importance of importance of exercise and of developing exercise habits. You will be healthier, happier, feel better, control your weight and improve your general physical conditions. See yourself exercising and loving the results and be proud of your accomplishments.